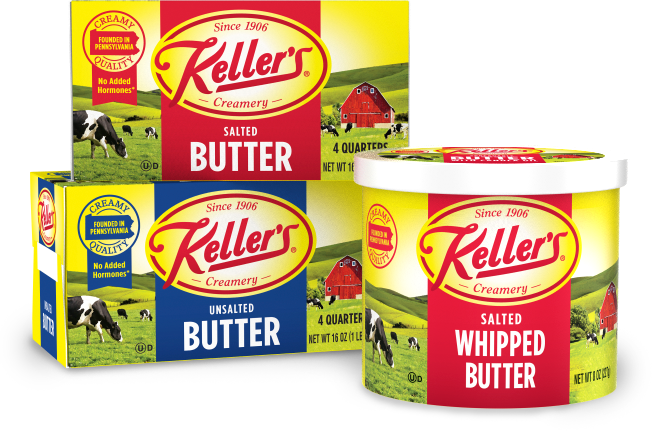 KELLER’S IS THE BUTTER THAT HAS BEEN CREATING FAMILY TRADITIONS IN PHILADELPHIA FOR OVER 100 YEARS. In 1906, Harvey and Florence Keller bought their first creamery. They later created the Keller’s Creamery label when expanding by purchasing the Indian Creek Creamery near Telford, Pennsylvania, in 1920. The Kellers continued to grow their business and were so successful that between 1940 and 1962, Keller’s Creamery grew quickly with the purchase of 12 local dairies and egg companies. The Keller’s Creamery brand was eventually sold to Beatrice Foods in 1964 who later sold it to the Borden Company in 1982. In 2002, Dairy Farmers of America (DFA), a dairy marketing cooperative that is owned by nearly 14,000 dairy farmers, came to acquire the brand along with the other high-quality cheese and butter brands. Today, Keller’s Creamery continues to be a beloved part of Philadelphia culture. The brand has been a mainstay in the Tri-State region for more than 100 years.